Salad as a Meal – Healthy Main-Dish Salads for Every Season is the latest offering from prolific award-winning cookbook author and expat, Patricia Wells. A true cookbook collector would need an entire shelf just for her cookbooks and she needs a shelf for all of her awards. 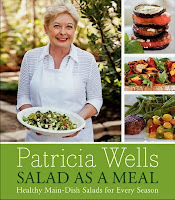 Most of her books have been about the food in France: The Paris Cookbook, Patricia, Wells At Home in Provence, Simply French; The Provence Cookbook, The Food Lover’s Guide to France, Bistro Cooking, and L’Atelier of Joel Robuchon.